We are very proud to release our new virtual showrrom walkabout. Detailing many of the ideas and concepts we use for our reception desks, bespoke seating units and storagewall. See how we can use various materials and styles of furniture to enhance your workspace. We are very proud of our most recent reception desk. 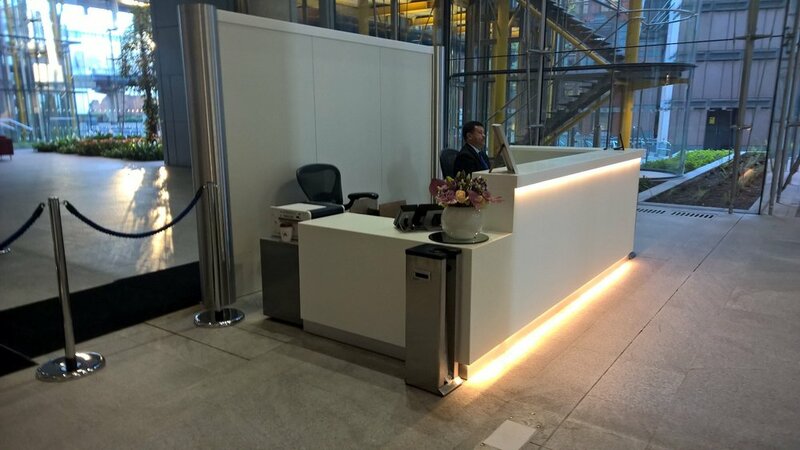 Supplied for one of our fit out partners, Nott office helped with the design of the counter and then went on to manufacture and install it. The counter and rear top cap to partition wall is made from Brilliant white resin (Corian), and with LED lighting to the plinth and shelf.